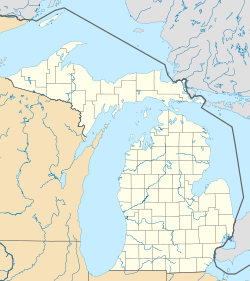 Leland is an unincorporated community in the U.S. state of Michigan. It was the county seat of Leelanau County from 1883 to 2008, when a new government center was completed in Suttons Bay Township, closer to the county's geographic center. Leland is located in Leland Township, which provides local government services. It is on M-22, at the mouth of the Leland River (also known as the Carp River) on Lake Michigan. Leland is the departure point for ferry service to both North and South Manitou Islands. The Sleeping Bear Dunes National Lakeshore is nearby and Traverse City is about 25 miles to the southeast. Leaving Leland, going south on M-22, there is a sign that reads "45th Parallel Halfway Between Equator & North Pole." Leland is built on the site of one of the oldest and largest Ottawa villages on the Leelanau Peninsula. Where the Leland (Carp) River flows into Lake Michigan, there was a natural fish ladder (which was a traditional Native American fishing grounds). The settlement was called Mishi-me-go-bing, meaning "the place where canoes run up into the river to land, because they have no harbor" or alternatively Che-ma-go-bing or Chi-mak-a-ping. From 1870 to 1884, the Leland Lake Superior Iron Co. operated an iron smelter north of the river mouth, supplied with ore from the Upper Peninsula and charcoal made from local maple and beech timber; the charcoal was produced in fourteen beehive kilns near the smelting furnace, which produced up to 40 tons of iron per day. In 1884, the plant was sold to the Leland Lumber Co., which operated a saw mill on the site. Other sawmills and shingle mills operated in Leland during the years 1885-1900. As early as 1880, commercial fishermen sailed out of the harbor to catch trout and whitefish, building wooden shacks where they processed their catch and serviced their fleet. Up to eight powered tugs once sailed out of "Fishtown," as the buildings came to be known. Today, the historic fishing settlement and two fish tugs, Joy and Janice Sue, are owned by a non-profit organization, Fishtown Preservation Society. Fishtown is home to a working fishery and a thriving charter fishing business. The riverfront is lined by a boardwalk and quaint shacks that have been converted into tourist shops. Leland is home to the Leelanau Historical Society and Museum, two blocks from Fishtown. ^ Littell, E.M., 100 Years in Leelanau, pp. 38-40. ^ "Fishtown Preservation". www.preservingfishtown.org. Retrieved 18 May 2017. ^ "USA Volleyball - Features, Events, Results". Retrieved 18 May 2017. Byron, M. Christine, and Thomas R. Wilson. Vintage Views of Leelanau County. Chelsea, MI: Sleeping Bear Press, 2002. Dickinson, Frederick W. A Short History of the Leland Iron Works. Annotated by Harley W. Rhodehamel. Leland, MI: Leelanau Historical Society, 1996. Littell, Edmund M. 100 Years in Leelanau. Leland: The Print Shop, 1965. Littell, Joseph. Leland: An Historical Sketch. [Indianapolis, IN: Indianapolis Printing Co., 1920], reprinted 1959. Mitchell, John C. Wood Boats of Leelanau: A Photographic Journal. Leland, MI: Leelanau Historical Society, 2007. Sommers, Laurie Kay. Fishtown: Leland, Michigan's Historic Fishery. Traverse City, MI: Arbutus Press, 2012.